A seventh birthday is not a traditional milestone but in an industry where less than 10% survive every year it is worth celebrating. It’s also a good time to reflect on the origins, that spark off an idea that launched a company that is back on the very pharmaceutical site that spawned the idea. Initially being made redundant was a blow, a devastating change to over 10 years of drug discovery experience. However after the shock came the contemplation and ideas of what to do next. Setting up a drug discovery company to supply venoms as tools that were clearly needed to advance modern medicine, was the idea and the path Venomtech still follow today. From putting a kitchen worktop in the back of a pet shop to act as a lab bench is a far cry from the pharmaceutical R&D lab we now have at Discovery Park, but it got us going. Those first sales, to Switzerland no less, were challenging for many reasons including finding a courier that understood what we were trying to do. We are now thankful for the service and support from A4P Bio that are also based on Discovery Park and have enabled us to ship spider venom to Australia and snake venom to India! From those humble beginnings we are now a team of five full time staff, including a Business Development Director who is delivering a growing sales pipeline bigger than we’ve ever had before. This growth is in part thanks to the great support from Expansion East Kent and Kent County Council. I never predicted in the outset the media exposure and the need for new skills for live TV and Radio, to clearly get your science across and answer any question, however random it may seem. Some of the highlights that come to mind are; filming with the BBC for Pain, Pus and Poisons, Spider House and BBC world wide (which was live), Live radio 4 commentary on venom collection at the science museum, Sky news and recently Sunday Politics. Print media has been much easier to master; these include correcting the world’s most venomous spider entry in the 2017 Guinness world records, being No 13 of the 20 greatest men you’ve never heard of (Short List Magazine), and commenting on medicines from venomous animals in The Sun. It taught me to be ready for anything when that phone rings! 2017 sees new opportunities opening up such as the launch of our first cosmetic active peptide, SensAmone P5 with our partners at Mibelle Biochemistry. This peptide blocks TrpV1 to sooth sensitive skin and comes from the leathery sea anemone, however the active site modelling in a small peptide was Venomtech’s work not the anemone. A full press release on this product will follow soon. Going forward into year 8 will see further growth in international sales for the pharmaceutical business, a blossoming of the new cosmetic business and a sprouting crop protection business that is currently a ripe seedling. 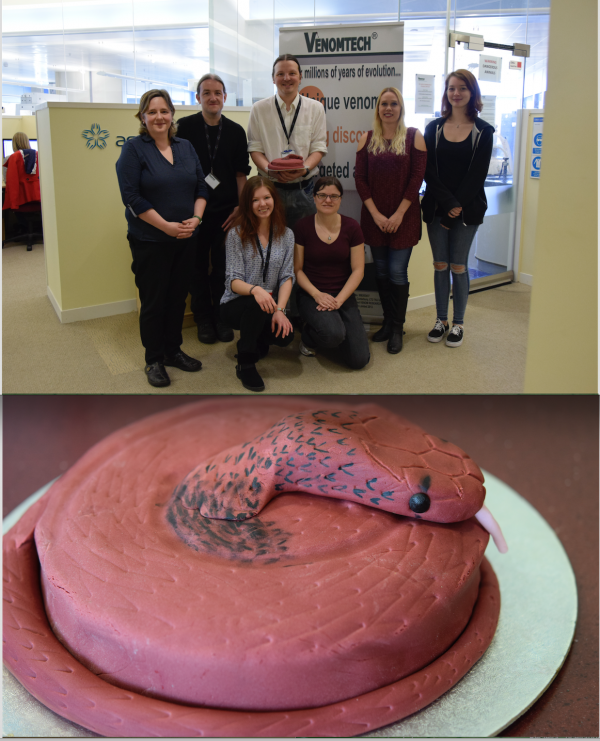 Here’s a photo of the lab team and our partners from Canterbury Christ Church University with the red spitting cobra (Naja pallida) cake to celebrate our 7th birthday and welcome year 8 with excitement.